This really isn't going to be a fluff article about how awesome Brick Classifieds is, but more of a small message that people are starting to take notice of it. Launching any new site is not easy at all. Google and other search engines don't even know you exist, so obtaining new customers via organic traffic is tough. Vendors that do list products don't have a lot of feedback so it's hard to show history and trust. So you might say, ok, what is so good about this? Those that have stuck it out and continued to post new quality listings with solid descriptions, real photos and priced their listings right have done well, real well. Brick Classifieds has been live for just about a year now and a little over 500 vendors have registered, listing a little more than 1,200 items for sale (there are more than 5,000 items in the system that are waiting to become active). Sales actually are strong for a new site, exceeding greater than $200,000 with an average sale price of ~$350. This shows strong interest in vendors listing high valued sets and taking advantage of the zero commission fee structure. Overall, Brick Classifieds has saved vendors over $20,000 in commission fees if comparing to a few structure like that on eBay. There have been a lot of enhancements on the site over the year and we continue to work on new features and tools. This week we will be updating and releasing price lookups to all the other marketplaces. This feature will show you what your item is going for on those sites and allow you to price your listing accordingly to take full advantage of the zero commissions fees but yet make more money. We are working on a few things for 2016 that could lead to a breakthrough moment for the site. I am in talks with a few developers to help build a native mobile app for the site that will allow for easy posting of new sets, minifigures and other LEGO related items. I have also had a few talks with Huw from Brickset.com to get Brick Classified's listings in front of that large community. I gave him access to an API to search for sets via keywords to appear within their LEGO database. We believe 2016 can be a breakout year for Brick Classifieds. Even though this new site may virtually disappear when put up against monsters like eBay, Amazon and BrickLink, but all sites need to start somewhere. There are some fantastic deals there to be found. Use the feature at the bottom of each listing to compare Brick Classified's price to those that might be found on eBay or Amazon. We will continue to plug away and making the site better, hopefully with the support of some of our fellow LEGO communities and our great vendors, everyone will learn that Brick Classifieds should be the first place to look when going to buy LEGO online! When someone mentions "where do I sell something" on Reddit /r/LEGO, I always tell them to go to BC. I notice I'm not the only one that mentions it either, which is pretty cool. I have a bunch of stuff I need to get posted. Thanks for the hard work on the site Jeff! I too have a bunch of stuff to post, but Nov. and Dec. were crazy in terms of listing/packing/post officing (yes, it is a verb) and then sourcing probably the best clearance Lego deals I've had in four years (in Canada). I've been spreading the word through all of my cash and outside ebay transactions, and I'll do a better job in the coming months. I also took a break on writing articles due to time constraints, but there are plenty of sets I'd like to talk about. More blog articles means hopefully more traffic which ultimately means more eyes on the Classifieds. Due to multiple articles about LEGO investing released over the last two days, we have had our best days ever and Brick Classifieds has benefitted as well, with its best two days traffic wise. Just moved a Live...I mean Death Star yesterday. It's picking up momentum! Thanks Jeff and Ed! 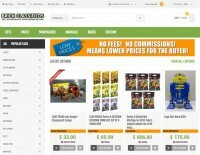 Yes lots of new eyes on this site as well as Brick Classifieds. You can tell by the highest number of sessions every on this site which has more than doubled since its last highest number. Brick Classifieds traffic has more than tripled in the past few days with a good number of repeat visitors. Just looked through the website. I like it a lot. A complaint I have is many of the prices are on the high side. Brick Classifieds charges less than Amazon/Ebay/etc to the sellers, so why not pass on some of the savings to the buyers? Especially since the folks buying on BC would be more knowledgeable. Like I'm seriously going to pay $525 for a Lego Death Star dollhouse version. Makes filtering through the website a bit less user friendly. And why not make a "used" search function? I aim to buy lightly used UCS over new and sealed. I get the same product for cheaper. I'd love it if I could filter out all the sealed sets. Just looked through the website. I like it a lot. A complaint I have is many of the prices are on the high side. Brick Classifieds charges less than Amazon/Ebay/etc to the sellers, so why not pass on some of the savings to the buyers? Agreed, and that's the real benefit of Brick Classifieds - allowing sellers to pass savings from fees to the consumers. That said, there's no way to force all sellers to sell at a certain price level, so the Macks are trying to let market forces play their role. Likely, we will continue to see a few listings here and there that are higher than typical retail, but there are many great deals on BC. 1. Check out the "Tag Search" at the top of the home page, and search the "used" and "UCS" tags. 2. Try out the "Want Ads" feature too - it's at the top of the home page screen and can be very helpful way to get tailored offers for specific sets you are looking for. Keep in mind that there are a LOT of Lego fans that are looking for lightly used UCS sets, so when they are listed they tend to get purchased quickly. It's actually a great reason to try the "Want Ads" feature. Just bought a set via Brick Classifieds last night. I feel I got a great deal with a fair shipping cost. Now it's no longer the set that I forgot to get while in NYC! Looking forward to it's arrival. Much continued success and growth Brick Classifieds!